Black Leaves of Envy were recently ordered by city council officials in Cornwall, England to keep their garage band practices around 30 or 40 decibels; however, after receiving noise complaints, the council banned the group from playing completely and they have subsequently not been able to practice for the past three months, according to local newspaper the Plymouth Herald. One of the young rockers' fathers, Andrew Plenty - a lead singer in his own rock band - tells the publication he launched a campaign to help garner community support in hopes of overturning the ban. "We're quite frustrated by the whole thing," Plenty tells the newspaper. "I would suggest, if they were playing jazz in the garage, it would not be a problem... There's a quote from Dave Grohl saying kids should get into their garages and start practising if they would like to be the new Nirvana. We've sent off a letter to Mr Grohl asking for his endorsement with our campaign." And on Tuesday, the Foo Fighters frontman did just that by writing a letter of support addressed to the Cornwall City Council, and he also posted the missive on Twitter. 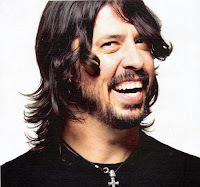 "Like many musicians, I started in a garage in my neighborhood together with friends," Grohl wrote. "My adolescent years were made better by playing music with others. Music is not only a healthy pastime, it is a wonderful, creative outlet for kids, and fosters a sense of community necessary to the emotional and social development of any child. It is tremendously important, and helped me through those otherwise difficult years growing up. "For musicians that lack the resources to rehearse in professional facilities, a garage or basement is the only place they have to develop their talent and passion... As a proud father of three aspiring musicians myself, I have always made this a priority in our home, to great results." He concluded, "For the sake of your local band Black Leaves of Envy, and for the generations of young musicians that they may eventually inspire, I ask that you reconsider the restrictions put upon the volume of their private rehearsal space. I believe that in doing so, you will be sending a message that Cornwall is not only a home to music and the arts, but a place that encourages children to follow their dreams in a world where anything is possible."